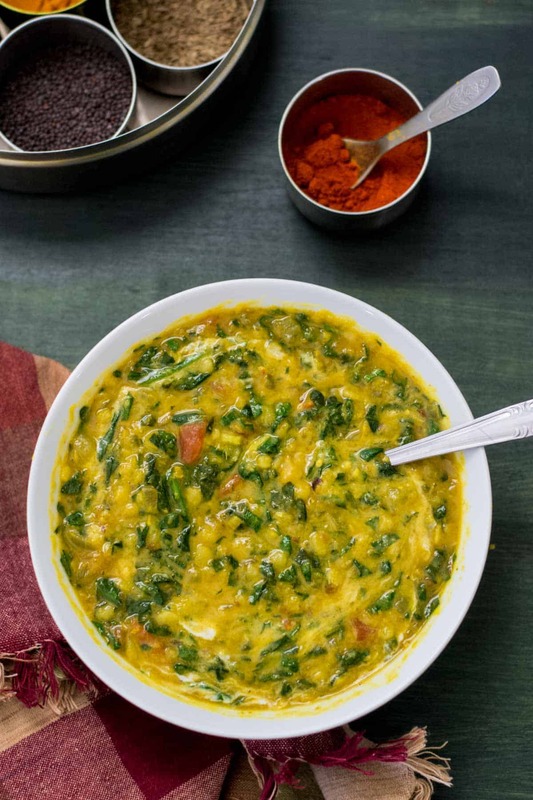 This mildly spiced, creamy version of Spinach and Tomato Dal (Dal Palak) makes for a delicious and nutritious main course served with hot cooked rice. I was not a big fan of dal (also known as the Indian yellow lentil soup to the western world) growing up and I may have harassed and annoyed my mom a few times during dinner by blurting out “Dal, again?” I know now.. that was not cool of me. But seriously, when I think of it, we ate dal pretty much every other day. That’s probably true for most Indians though, as dal is such an integral part of an Indian diet. While a part of me was thankful to have food on my plate, the other part detested the idea of having to eat the same thing for every meal. 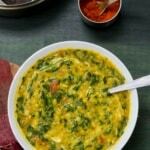 This aversion to dal changed though when my roommate in grad school introduced me to a new dal dish – Dhaba style Dal Palak or Spinach and Tomato Dal. Served with a side of rice stir-fried in ghee, this spinach and dal curry was creamy, delicious and mildly spiced just like the recipe in this post which by the way is not mine. It is from the book – The Chile Pepper Bible: From Sweet & Mild to Fiery & Everything in Between. I was asked by Kathy Hester (who posts amazing vegan recipes at Healthy Slow Cooking) if I would like to be part of The Chile Pepper Bible blog tour and I instantly agreed. I could not wait to get my hands on this comprehensive book which explained the many varieties of chiles and provided absorbing information on everything from the historical and geographic origins of chiles, to information on The Scoville Scale (it measures the hotness of a chile and was invented by Wilbur Scoville), health benefits and finally, 250 delicious and inventive recipes. It was hard to pick one recipe to post about because all the dishes in the book look amazing. In the end, I chose the Spinach and Tomato Dal recipe because it was THE recipe that changed the way I looked at all dal recipes. Dal Tove – A simple lentil soup recipe which can be made in a jiffy. Dal fry – Restaurant style dal fry made easy. One pot moong dal khichdi– This rice and lentil porridge is comfort food at its best. In another large saucepan, toast cumin and coriander seeds over medium heat, stirring, until fragrant, about 3 minutes. Transfer to mortar and grind to a powder. In same pan, heat clarified butter over medium heat. Add onion and cook, stirring, until softened, about 3 minutes. Add garlic and ginger and cook, stirring, for 1 minute. Stir in salt, chile powder to taste, turmeric and reserved cumin mixture. Season to taste with black pepper. Stir in tomatoes and juice, and bring to a boil. Stir in drained cooked split peas, stock and lemon juice. Reduce heat and simmer until flavors are melded, about 5 minutes. Add spinach, in batches, stirring to submerge each before adding the next. Cover and cook until spinach is wilted, about 5 minutes. Ladle into warm serving bowls. Drizzle to taste with yogurt (if using). This is another keeper for me. I’d never added lemon juice or pepper to spinach dal before. I really liked the tangy twist to the flavor. I also didn’t add yogurt to the recipe at the end but did top off the dal on my kids’ plates with a dollop of yogurt to get the creamy texture you mentioned and they sure loved it! Glad you enjoyed it, Deepti. As always appreciate your feedback.